Ayala Asherov is one of the many talented filmmakers screening their work at the festival this week. Hopeful up and comers will compete for prizes and career making recognition. Films will vary in subject matter from the nostalgic romance of Love Scene, to the riotous meth heads of Cracker Att ic (both films up for screenplay awards). Don’t get me wrong, there is much more to this festival than sitting in the dark watching movies, there will be tons of talks, workshops, and parties to attend. If your tush is tired of theater seats, check out a sound-scape editing workshop at the College of Charleston, or hear actors bring scripts to life at a table read in Society Hall. Hit up some drinks and dancing at after parties held at The Alley or The Republic. There will be chances to meet movie moguls and inspiring characters like the real Frank Abignale, Jr. Remember when Leo DiCaprio wore the hell out of that pilot’s uniform playing the role of Abignale in Catch Me If You Can? I sure do. So go, celebrate the cinema in style at yet another one of Charleston’s impressive arts festivals. 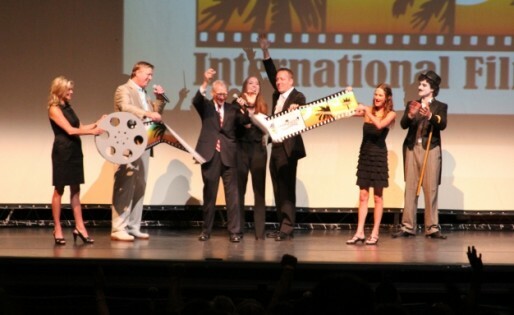 The Charleston Internation Film Festival is not one to miss! Check out the full schedule here! Also, look out for Ayala Asherov-Kalus performing original music at Piccolo Spoleto this June!